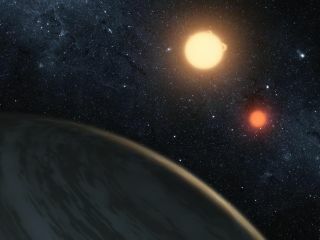 An artist's image of Kepler-16b, the first known planet to orbit both stars in a binary system. Binary system Kepler-47 contains at least one planet in its habitable zone. The two stars have different masses, however, and so the habitability of such planets is limited by the shorter lifetime of the larger and more massive star. Mergers between stars, the ultimate fate of around 20–30% of O-type stars, are violent events. But even the comparatively gentle scenario of vampire stars, which accounts for a further 40–50% of cases, has profound effects on how these stars evolve.